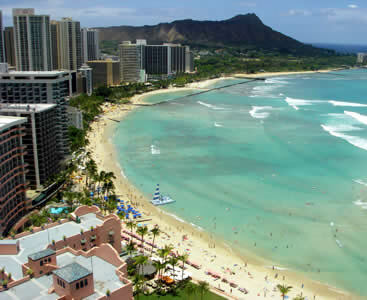 Warm sunny beaches and cool ocean breezes are what come to mind when you think of Honolulu, Hawaii. There are many attractions to visit while you are in Honolulu. After you land on the island of Oahu at Honolulu International Airport you can have your airport transfers ready and waiting to take you to and from your accommodations at one of the many luxurious beach resorts close to downtown Honolulu such as Halekulani Hotel or the Moana Surfrider which is a luxury Westin hotel resort and spa located on Waikiki Beach. There are all types of shuttle services available from private all-inclusive SUV’s to shared ride vans that can get you to your destination safely and conveniently. The capital of Hawaii, Honolulu, is considered to be one of the magnificent places on earth. It is purely a holiday destination; with its long beach lines, clear waters, and luxurious lifestyle it attracts tourists in numbers every year. The city is filled with tropical beaches and scenic mountain trails that you can drop by for a hike while you are here. If you are going to be near Hawaii Kai there is the Hanauma Bay which is known for its trails, snorkeling and beautiful beaches. If you are near Waikiki you can drop by Diamond Head which can give you breathtaking views as you take your time hiking through the trails near its volcanic surroundings. The place has countless resorts, hotels, restaurants, and other structures due to which people are pulled here throughout the year. The trademark of the place is its white sand beaches with palm trees and never-ending deep blue waters. Scuba diving, snorkeling, paddling kayak, cruise rides, fishing, and other water sports are specialties here. 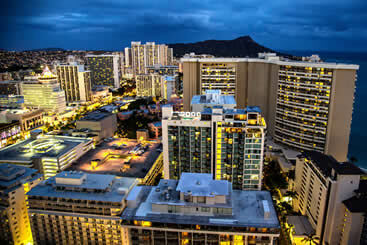 The city of Honolulu offers thrilling adventures in the daytime and hosts ravishing parties at night. This is what makes this place a pure heaven on the face of the earth. Getting here has become a lot easier with HNL Airport. It is a huge facility which serves most of the Hawaiian air commutation. The airport features first offshore runway making it one of a kind. The plane running on a manmade platform gives a unique experience which you won’t get to enjoy anywhere else. The airport lacks Wi-Fi service but the beautiful views offered by the surroundings of the airport make up for that. Due to high traffic, the speed of customs often gets slow but that doesn’t let the quality of the service go down. The staff is always quick and efficient in their work. Present along the clear waters of Mamala Bay, the flight gives amazing views both during takeoff and landing. Honolulu International Airport is one of the busiest in the country, especially in peak vacation months. This makes it increasingly important for travelers to not only understand exactly where to go, but figure out how to do it in an efficient time. Don’t waste precious minutes of your relaxation or business travels by booking a shared ride van with us, a simple and quick way to get from the airport to your hotel room. In addition, because shared ride vans are so affordable, you’ll be getting to your destination without worry and without hurting your wallet. Diamond Head is one of the island’s most historic locations, mainly because it is a volcanic landmark that has a rich military history. Walk to the top of the peak and get there easily by having your private van drop you off near the base. You can book with area providers, a local island transportation service that will take you anywhere you want to go, including the incredible ‘Iolani Palace, which is the beautiful home of Hawaii’s final monarch. Honolulu is home to a wide variety of World War II artifacts, especially in terms of the United States Navy. Book a private sedan with service companies and drive over to amazing warheads like the USS Missouri and the USS Bowfin, each one as massively historic as the last. Many more ships are located at Ala Moana Beach Park, which doubles as a historic landmark and recreational area. Take the kids out to the famous Honolulu Zoo, which has over 900 different animals and 42 acres under the beautiful Hawaii sun. You can get everyone there comfortably and without wasting time by booking a private SUV with a professional local company that sometimes gives special deals to their customers. Before taking the kids back to the hotel, be sure to stop by other exhilarating attractions like the Waikiki Aquarium, a facility that houses some of the most interesting aquatic life the volcanic islands have to offer. Celebrate one of the most beautiful places on earth by eating at Honolulu’s gorgeous Morimoto Waikiki, a Japanese restaurant with a celebrity chef. Arrive to the hotel lounge as if you own the island by reserving your very own stretched limousine. With leather seats and smooth wheels, you can travel the island in class, visiting fancy cocktail bars like Lewers Lounge and seeing incredible sunset views from exclusive hotspots suggested by your local chauffeur. The island may be small but that doesn’t mean big groups aren’t invited. Reserve a private chartered bus and go for a group dive at Hanauma Bay, one of the most beautiful places to snorkel on earth. While your group is out and ready to explore, be sure to take a drive to the stunning waterfalls of Manoa Falls, a fantastic place to go diving, hiking, or simply take photos of mother nature acting out some of her best work. When looking to explore areas outside of downtown Honolulu it is good to know which sections may best suit your vacation needs. For a slower and more quiet area, the Manoa-Makiki is a perfect destination for those who want to enjoy the beauty of Hawaii without all of the hustle and bustle. If you want a faster paced vacation with lots of beaches, surfing and plenty of hotels to choose from then Waikiki may be a better choice for you. It has one of the most well known beaches in the area, Waikiki Beach, where anyone can learn to surf or to simply take a day to canoe with friends. For a calmer day at the beach Ala Moana Park is a great choice for a sandy beach setting with lots of grass and greenery for the family to relax and play in. 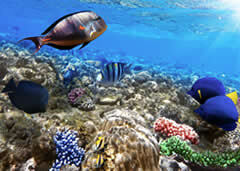 The Waikiki Aquarium is one of the oldest aquariums in America and is located on breathtaking Waikiki Beach. The aquarium is located close to a coral reef and has hundreds of thousands of travelers drop by each year to view the thousands of aquatic animals on display in its exhibits. One of the attractions that is most popular with visitors is the Hawaiian Monk Seal Habitat. This animal is endangered so viewing one in real life is a treat no matter your age and an experience you won’t come across often. With a huge variety of unique sea life that you would expect from a Hawaiian aquarium, there are jellyfish, zebra sharks and eye opening octopus displays that will keep your children entertained for hours. Honolulu Zoo is an attraction unique to Hawaii which can be found in the Queen’s Kapiʻolani Park. Travelers planning a visit to the zoo for the first time can take in an amazing display of almost 1,000 animals in the various exhibits featured throughout the 40+ acre park such as the Komodo dragons and the popular orangutans. There are endless exhibits showcasing Pacific Island animals as well as tropical forest species. Visitors can take tours and learn about them all during their visit. 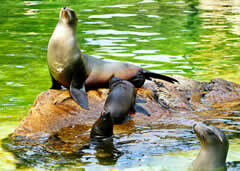 The Honolulu Zoo has a large list of endangered animals that are cared for here such as the black rhinoceros, the sumatran tiger and even a nile crocodile on display for you to learn about and observe as you make your way through the park. When you land at Honolulu International Airport you will be on the island of Oahu and possibly the Reef Runway. This runway was built offshore and was the first of its kind worldwide for travelers. SpeediShuttle and Fly Shuttle have discount rates for shared ride shuttle vans from the HNL airport while ExecuCar and Blacklane can provide some of the best rides for all inclusive sedans. Hawaii has many rides to nearby tropical resorts for travelers especially ones that are close to downtown Honolulu where you can find limousine and sedans pickup locations. If you are looking for oceanfront hotels then you can check out Hilton Hawaiian Village Waikiki Beach Resort as well as the luxury Outrigger Reef Waikiki Beach Resort. For a Hawaiian food experience you can try to sort through the many options in Hawaii to visit but a few you may not want to miss include Helena’s Hawaiian Food, Hula Grill Waikiki and Ono Seafood. Take a glimpse of our history by visiting the Pearl Harbor’s World War II Valor in the Pacific National Monument and for those wanting a day of snorkeling then the Hanauma Bay Nature Preserve may be one of your best visits.